Let’s be clear, every modern man or woman is affected by stress. This occurrence can sometimes be motivating, inspiring or useful, but in many cases stress is bad for our body and mind. So let see how to deal with stress. When people have problems in their relationships, too much work and financial problems they can expect to experience high levels of stress. So, even though low level of stress can be useful, too much stress can cause chaos in your body and lead to mental and physical ailments and diseases. According to the APA (American Psychological Association), major acute stress, that comes as a result of unexpected problems like arguments with your partner or family or witnessing an event like mass shooting, fire or earthquake can lead to negative effects on your health on many levels. Scientific studies have confirmed that unexpected, severe emotional stress can activate health problems like irregular heart rhythm, heart attacks and even sudden fatalities. It is good to point out that in most cases these things happen to individuals who already had heart issues, but the truth is that no one is safe. Besides the negative impact on our heart, experts claim that excessive stress can bring negative effects to our health in few other ways. For instance, stress can lead to muscle tension and cramps, migraines, muscle aches, fatigue, digestive problems, chest pain and insomnia. This unpleasant phenomenon can alter your mood and make you feel anxious, unmotivated, sad, restless, irritated, angry and depressed. In addition, stress can lead to making poor judgments like drug and alcohol abuse, under-eating and over-eating, explosive outbursts of anger, social isolation and increased use of tobacco. Very intense stressful events can affect our physical health in many different ways and we will explain some of these effects and how to deal with stress. Stress can lead to the formation of acne because increased stress levels lead to increased production of cortisol and other hormones. The increased level of these hormones signals the sebaceous glands to create more oil. When the skin is too oily, there are more chances for the pores to get clogged and to get acne. A recent scientific study conducted by the neuroscientists at the Berkeley University of California has revealed that stress leads to change in the structure of our brain. This change includes unusual differences in the size of gray matter vs. white matter. It also changes the amygdale dimensions and connectivity. According to many experts, there is a connection between heart health and stress. Stress has impact on behavior and other things that can lead to heart damage like smoking, lack of physical activity, overeating and hypertension. There are many people who decide to handle stress by drinking too much alcohol or following some other dangerous habit that has even more negative effect on the heart. As we have already mentioned, stress leads to increased heart rate. At the same time, the lungs need to take more oxygen and deliver it throughout the body. Statistics show that individual’s blood flow usually increases for 300% during stressful events. in addition, to the increased amount of oxygen, an increased number of blood cells go all over the body together with oxygen. Stress leads to higher amounts of cortisol. This hormone encourages appetite. 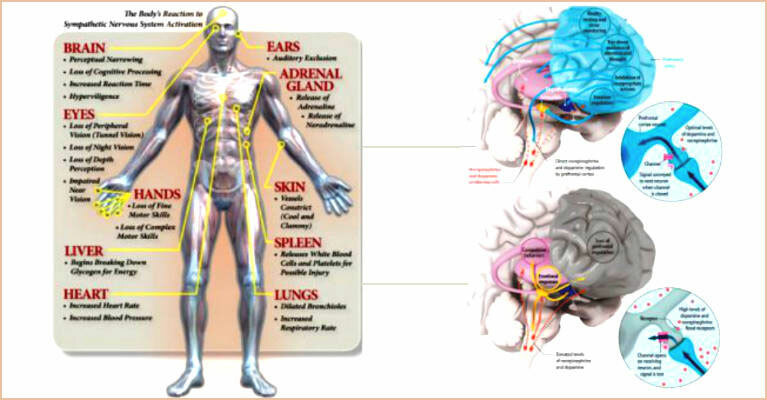 Cortisol will remain in our body even after the stress is gone which makes people eat more and increase weight. The good news is that there are healthy strategies that can help you learn how to deal with stress. Feel free to follow one or even two of these strategies because different things work for different people and you must try them before you determine what’s best for you. In case something on your mind is causing you frustration or discomfort, take a notepad or use your computer and write down your thoughts. In this way you will create a log of stressful situations after a while. After a while, you will realize what bothers you the most and what causes stress the most, so you can easily develop a strategy to eliminate the source of stress. Don’t forget that your family and friends are here to support you, so don’t hesitate to share your feelings with them. You don’t need to seek advice because sometimes talking about problems with others will help you find a solution. Find time to get involved in something that makes you happy and relaxed. In this way you will rest your mind and body. You can try different hobbies like writing, playing with pets, painting, hiking, crafts, gardening etc. It is crucial to find a way to release stress. Many experts claim that physical activity supports body’s efforts to relax and eliminate stress in a natural way. In addition, exercise can strengthen your body and improve your self-esteem.